Fat Hen is one of those soft and non-bitter greens which can be substituted for spinach whilst chickweed makes a tasty salad leaf. We forage both of these weeds down on our plot, where they grow in great perfusion. They are entirely edible, but at their best when young. I also used garlic scapes instead of garlic as that’s what we have at this time of year. Apart from the greens, I used the classic ingredients of pine nuts, Parmesan cheese and olive oil. I may be vegetarian and generally I try to buy vegetarian cheeses, but cheese is an area where I don’t toe a strict line. Cutting out Parmesan from my diet, as well as our delightfully flavoursome Cornish cheeses, would be a very hard thing indeed. Of course a vegetarian alternative hard cheese can easily be used instead. To make the fat hen and chickweed pesto, I used my Optimum 9200 Next Generation blender, which blitzed the leaves, nuts and chunks of cheese down to a paste in seconds. As regular readers will know, I’m making good use of this powerful tool and use it nearly every day. This was an easy job for it, but I blend all sorts of tough vegetables and other matter in my morning smoothies, that I couldn’t even contemplate in my old blender. If you are after a good blender, I would highly recommend this one, which is currently the most powerful on the market. At the moment, there is an £80 discount, so now is a good time to buy. Just click on the link above, or the one in my sidebar. The pesto was so very good, it was hard not to spoon it straight from the jar into my mouth, but I managed to resist – for the most part. We’ve been eating it mainly on pasta, because that really is the best thing you can do with it. It makes for a very quick meal, which is just what is needed on busy days. Spread on seaweed crackers, it also makes a very tasty lunch. 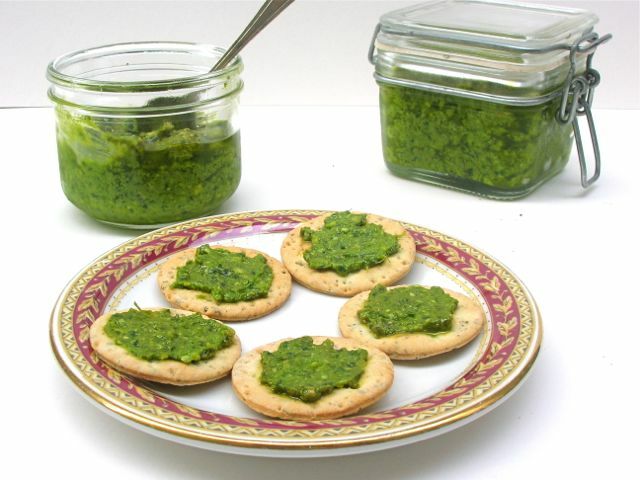 For a more frugal pesto, you could replace the pine nuts with hazelnuts and the Parmesan cheese for Cheddar cheese. For more dip and spread ideas, you’ll find plenty in my delicious dips and spreads Pinterest board. Thanks for visiting Tin and Thyme. 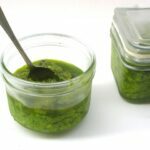 If you make this recipe for fat hen and chickweed pesto I’d love to hear about it in the comments below or via social media. Do share photos on your preferred social media site and use the hashtag #tinandthyme, so I can spot them. For more delicious and nutritious recipes, follow me on Twitter, Facebook, Instagram or Pinterest. A delicious pesto which can be used on pasta, spread on bread or crackers or diluted with a little olive oil and used as a salad dressing. Place all ingredients into a high speed blender and pulse until the mixture is blended to a not quite smooth paste. Scrape into two sterilised jars, seal and keep in the fridge until needed. Makes two medium sized jars, which can be kept sealed in the fridge for a couple of weeks. Spinach can be substituted for the fat hen and chickweed. I am linking this to Pasta Please which is hosted, this month, by Lucy over at Baking Queen 74. This monthly challenge originates with Jac from Tinned Tomatoes. Containing plenty of wild greens as this pesto does, I am sending it off to Shaheen over at A2K – A Seasonal Veg Table for Eat Your Greens. I’m also sending this off to Ren Behan for Simple and in Season – which this recipe most definitely is. There is a lot of leaves in this pesto but I doubt any fussy eaters would notice, so I’m sending it off to Helen at Fuss Free Flavours and Michelle at Utterly Scrummy Food for Families for Extra Veg. Yum, this pesto looks delicious. I wouldn’t know where to start with cooking with weeds or wild plants! But it would be a shame to throw them away, because they are very tasty and I expect have all sorts of good things in them. Didn’t know they were edible! The pesto looks very delicious, Choclette. Thank you Angie. I’ve just taken some photos of both weeds and will add them to my post when I get a chance. Thanks Sus, there’s something really satisfying about eating ‘food for free’. Thanks Emma, I’m going to add some pics of the plants to my post when I get five minutes. I have never heard of these weeds so I am amazed at their use. I’ve put pictures of them both up on the post now Nayna – might help! This pesto is incredible! Love the ingredients and the bright green result! I will surely make it ( I’m one of those pesto-addicters) 🙂 Thank you for sharing my Rocket pesto and Broccoli pesto recipes! Thank you Andrea, it makes a nice change and is truly delicious. And like you, I love the vibrancy of it. Gosh you’re so clever, I would never have dreamed that you could use weeds in a useful way! Love it! Becca thank you, but I’m sure you did. How about wild garlic? Maybe I’ll have to start planting ‘weeds’! I’m really grateful for the weeds Helen as it means we’ve got something to eat from the plot, even if we’ve not managed to plant much – always so much to do! Yay for free foraged food! I don’t think we have Fat Hen round our way, but there is certainly plenty of chickweed, love how you have used it. Thanks Janice. If you can be bothered to collect enough chickweed, I bet that would be fab all on it’s own. This looks brilliant, I love pesto but have never made it before. I didn’t even know there were so many variations. Thanks Louise, it really is good. 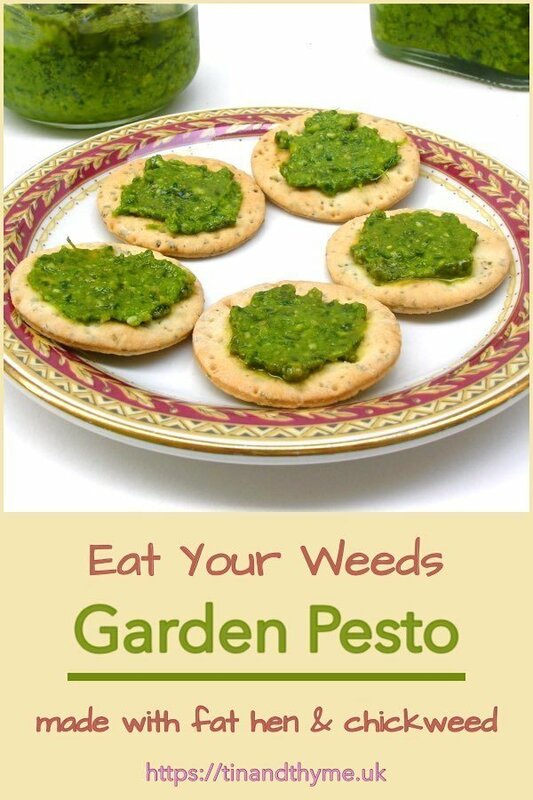 This is such a brilliant use of these “weeds”, I now feel guilty for feeding them to the chickens. The chickens on the other hand are looking worried. I am very, very definitely in favour of eating weeds. I’ve usually got plenty. This sounds like an excellent idea. I know that ground elder is edible too and I’ve got plenty of that but I’ve tried it and I’m not convinced so far about the taste. Haha, yes indeed Phil. Weeds are one of the sure fire things that are guaranteed to grow. Pesto is one of my absolute fav things ever so I really like learning about new greens to use. Ah yes, pesto is a brilliant thing, if homemade. I’ve never yet found a bought one that I like Bintu. I tend to stick to the ‘baby end’ of foraging but this really sounds a great idea, Choclette. I live near a bountiful woodland with loads of goodies to choose from. I’m sure if I walk only a few metres I will find what I need! These two greens are annuals and grow in disturbed soils Kellie, which is why they are so commonly found in gardens. I confess I haven’t heard of fat hen, and probably won’t recognise it. I do use nettles and dandelion leaves in cooking, but need to expand my range. Very inspiring recipe! Thanks Sarah, it’s true. I’ve learnt masses since I’ve been reading blogs. As the name implies, fat hen was traditionally fed to the chickens along with chickweed – well if it’s good enough for the chickens …! I am always so impressed with your use of weeds and things growing in the garden! Using weeds scare me to death….. I wouldn’t know which are which!! Well I am lucky there Kate. CT is a botanist, so I’ve always got someone to check with if I’m unsure. Thanks Nadia. I just love the vibrancy of colour the weeds have given and it tastes very good too. Lovely, I really like Fat Hen, my mother makes an awesome dal with it. I will have to drop a hint and see if you will make it again. Thank you for sharing with #EatYourGreens. Ooh, that dal sounds delicious Shaheen. We use Fat Hen as a general “spinach” substitute, but I’m not sure it’s gone into a dal before. Thanks Ren and what a lovely surprise the book was. I’m really enjoying it, lots of inspiration there.